Some cities are naturally linked to certain buldings and outstanding events. In case of Saint Petersburg it´s the Herimitage or the White Nights which immediately come to my mind. Saint Petersburg seems to be the complete opposite of Moscow with the countless numbers of expensive cars. The people here are much more open and interested in information about my country or my work. At first, the city reminds me of Amsterdam with it´s canals; then I notice all the old buildings of the tsar era. Especcially the huge amount of splendid churches and the view over the Neva got my attention. I have to confess that I´m pretty bad in orientation within a new city. So it happens quite regularly that I look lost when I try to find my way back home. In this city I had the impression that anybody always asked me for help or gave me amazing tips where I could find the best bars and restaurants. One of these buildings I can´t get enough of is the The Church of the Savior on Spilled Blood. The different colors, countless numbers of mosaics and gold decorated steeples turn this building into a wonderful eye catcher. I was so thrilled, that I just had to shoot an outfit in front of it. Love your outfit! Great jacket! Great outfit! Love the color of your jacket and stripes are a favorite print of mine!! Lookin’ good, handsome! Perfect bomber jacket! And stripped t-shirt underneath makes great combo =). Really cool outfit. Russia is very beautiful indeed. Fantastic outfit! 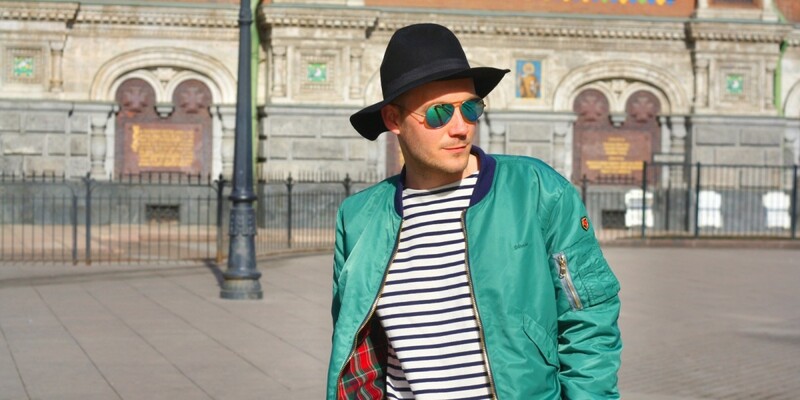 Love your hat and the green jacket. Lovely church too! A gazillion points go to the guy who can match his sunglasses to his jacket to the building he’s standing in front of. And that would be you, darling. Well done!